Amie's Mission — The Amie Muller Foundation. Helping Military Families affected by Pancreatic Cancer. As you can imagine, fighting any cancer takes a physical and emotional toll, but can also take a financial one was well. Caregivers and spouses often take a leave of absence from work to care for their loved one fighting cancer. While none of us can fight the battle for anyone, we can support a family with financial assistance to help pay the medical bills, childcare, and extensive travel needed for chemotherapy treatments, etc. Amie has spend her life dedicated to serving our country and taking care of of so many others, and will continue to do so through The Amie Muller Foundation. Our goal to start off with is to help 5 military families each year who have a loved one diagnosed with Pancreatic Cancer(Pancer). We will offer resources, education and advice to help fight this horrible disease. The maximum assistance we will give a family will be $5000 and will be based upon financial need. We will also raise money for the most important and vital research that needs to be done to find a way to detect Pancreatic Cancer early. This is the most important task to increase survival odds in the future. We will donate half of the proceeds we raise each year to http://www.codepurplenow.org in Amie's name. Mark your calenders for a special Acoustic Showcase on Friday, May 18thth at The JX Event Venue in Stillwater. All proceeds will go to the Amie Muller Foundation to help support a military family in need and Pancreatic Cancer research for early detection screening. Hope to see you all there. Let's raise some money and make a difference. You can support the Amie Muller Foundation 5 ways. 3. Buy buying Amie Muller Foundation Merchandise. Go to http://www.cafepress.com/amiemullerfoundation for T-shirts, sweatshirts, mugs, key chains, stickers and magnets. All profits go to the Amie Muller Foundation. 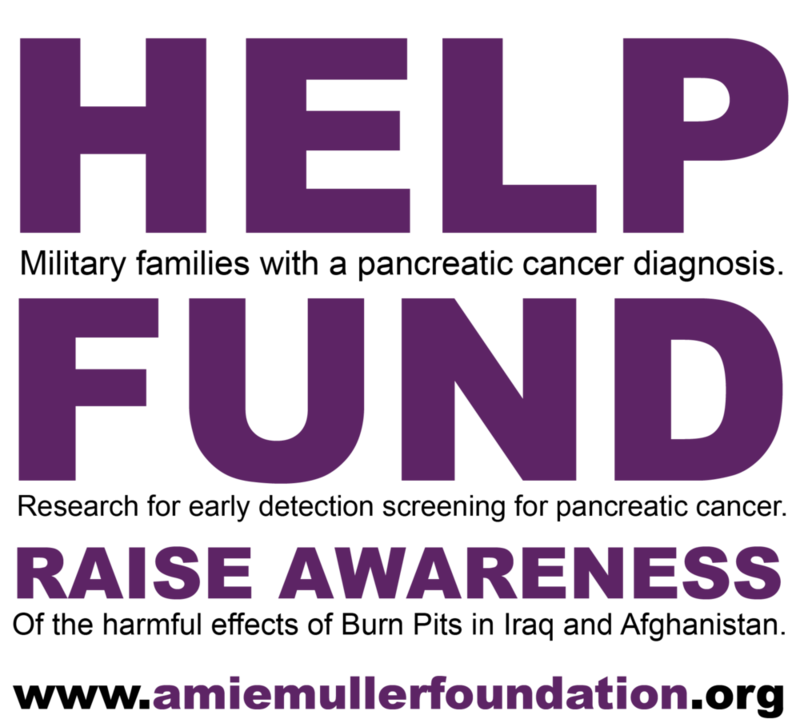 Order an Amie Muller Foundation T-Shirt to help support a military family affected by Pancreatic Cancer.